If you want to lose weight, do not skip breakfast. Studies confirm that you should incorporate eggs in your breakfast menu. A study published in the magazine International Journey of Obesity showed that the eggs are excellent allies in weight loss. During the two-month study, two groups of obese people were monitored while on a diet. One group had two eggs for breakfast, and the other group consumed buns. Both groups had the same amount of calories in the first morning meal, but in 65 percent of cases, people who consumed eggs lost more weight. In addition, they said they had more energy than the subjects who started their day on a carbohydrate meal, and their body mass index was significantly reduced. 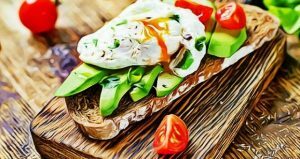 These results do not surprise the nutritionists who consider eggs as an excellent source of protein that effectively satiates and prevents overeating in the rest of the day. They also help regulate good cholesterol and are rich in vitamin B12 and choline, which ensures the normal functioning of all cells in the body. It should be noted that one hundred grams of eggs have about 160 calories, but that this figure increases due to the heat treatment or frying in butter or oil. For a healthy diet it is best to cook the eggs, and combine them with vegetables in a fine salad.